It’s impossible to be ironic, detached, intellectual, and objective in war. A journalist enlists in the Marines, and we follow his journey from basic training to reporting on the front during the Tet Offensive. 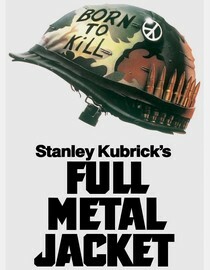 See also: the Kickstarter project to turn Matthew Modine’s limited edition book Full Metal Jacket Diaries into an iPad app.